Oil painting titled “Around the Bend” and below is “c’mon cow”. These two oil paintings are titled – top “Down River” and below is “Good to the last Drop”. 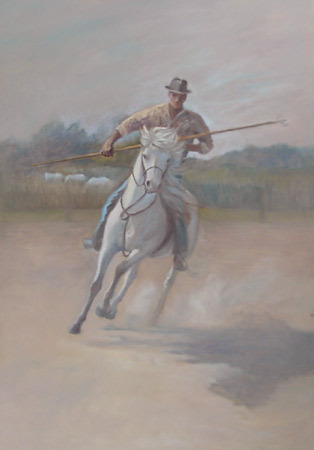 These two oil paintings – top is titled “Third River Crossing”, and below is “Ranch Ropers”. These all can be seen at ECR gallery in Cambria CA. Please see the address on top of this page. These paintings are part of a show, to see more please click here! The mares give birth to their foals in the wild marshy areas. They have to know not to give birth where the foals will drown. Only this special breed of horse has been able to survive the harsh conditions of the Rhone delta of the Camargue on the coast of the Mediterranean sea.The foals are born with dark color coats and then turn to grey then white as they grow older. The horses have to be able to withstand the Mistral winds and freezing cold of winter, and biting insects in the spring and summer. They have adapted to eating the reeds that are growing right in the water. The mares were used for threshing the grain until modern threshing machines came into use in the 1950’s. So the mares live their lives in the marsh raising foals. The young horses sometimes stay with the herd for a year or two, learning to run in the mud, up and down uneven slopes, play-fighting, mutual grooming, and all the tricks of the trade that will come in handy when the colts are gelded and become riding horses. The fillies will be kept for future brood mares.Herds of horses still often live with herds of historic Camargue cattle, so are very brave and useful when it comes to using the horses to work the cattle. The Gardians are accomplished horsemen who established a society in 1512, with specific duties and regulations pertaining to the raising of the cattle and horses. The Camargue cattle are fierce, black, with white horns shaped like the musical instrument known as the “lyre”. Before the 1950’s there were no fences in the vast delta area. The herdsman lived on his horse keeping track of the herds of horses and cattle. It was very important to keep the herds with stallions separate so that deadly fights would not erupt among them. Cattle similar to these are found in paintings dated to 35,000 years on the cave walls of Chavaux, just inland from the Camargue area in Rovence, Southern France. The rider is demonstrating the use of the historic trident, used in working with the cattle of the Camargue. The Gardians are horsemen of the Rhone delta region in southern France, where they have raised horses and cattle for hundreds of years. They don’t use ropes or lariats (riatas) as the Spaniards do for the branding, doctoring and working of the cattle. The horses are raised “en liberte” so they are very surefooted in rough terrain. Working the cattle takes a lot of teamwork on horseback and on the ground.